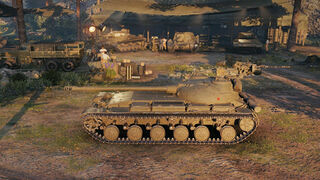 The Object 430 Version II is a Soviet tier 9 medium tank. Developed at the Construction Bureau of Factory No. 73 in early 1953. From March 8 through March 10, 1953, the Ministry of Transport and Heavy Engineering considered the project, along with an alternate version of the tank with a more conventional configuration. However, the development was eventually discontinued. A peer of the T-54, the Object 430 II is a flexible multipurpose medium. Sporting bouncy armor, respectable firepower, and good mobility on a small, well camouflaged chassis, this is balanced by the clumsiness that comes with the limited turret and poor gun depression. The Object 430 Version II leads to the K-91. The Object 430 Version II is a natural evolution from the Object 416 (or at least Wargaming wants it to be), but distinguishes itself in more than a few ways as well. It is armed with effectively the same guns as the T-54, but possesses even higher penetration on AP rounds; despite the 248mm of penetrating power is still surpassed by RO L7 guns, it could also be offset to a lesser extent by their premium HEAT rounds, which boost the penetration to a ridiculous 330 mm. This is, however, very expensive to run, and HEAT rounds are not without their own limitations. The M-63 has worse gun handling compared to the D-54, and also loses in terms of RoF; but since both guns have the same HEAT round, the M-63 can be considered decent enough for a stock vehicle. The D-54's higher base penetration is useful, as is its much higher shell velocity, but the experience cost is no small amount. Unlike the fragile Object 416, the 430 II is blessed with adequate armor for a sniper-supporter tank. Unlike most other cast dome-shape turrets, the 430 II has the same 180mm thickness running across the entire turret front, making unaimed shots likely to bounce off. It does not have any real weakspots beside the somewhat small turret roof, which means lights and many lower tier vehicles will have trouble trying to penetrate that. The upper glacis is very sloped, but way less armored than that of the T-54. In addition, the lower plate is not well-angled, and can be penetrated by even Tier 6s, both should be hidden whenever possible. The side armor is thick enough to pull off auto-bounce against all but the largest calibres, which can be life saving. The 430 II is also blessed with a small silhouette and great camouflage values, giving a survivable package. The 430 II has a lower power/weight ratio than the T-54, but this is partially compensated for with better terrain resistance values. Its mobility is mostly comparable to the T-54's, although it will struggle somewhat more when climbing hills. The agility also helps compensate for the limited traverse of the turret. Overall, the 430 II plays similarly to the previous vehicle, but with two very important improvements in mind. Firstly, the better gun can fend off intruding hostiles easier with its more accurate and higher penetrating shot, as the extra degree of gun depression and narrower turret profile enables the utilization of many unique defensive positions; while the improved armor profile is no less than tricky to handle well, it does enable a more aggresive mindset. Research the Object 430 II Enhanced turret. The upgraded 430 II Enhanced tracks should be your next target. Next, the 4TDF engine should be equipped. If you have not already done so, finalize the grind by researching the 10RT-26 radio. Choose equipments carefully. Stock tracks cannot carry the top configuration and full set of equipments, otherwise consider mounting the ETB. Grind and mount the 100mm D-54U gun. 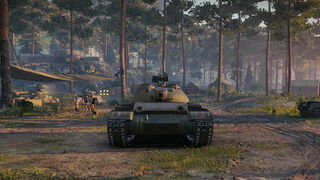 Grind the Object 430 II Enhanced turret for better gun handling, view range and hitpoint. Grind the tracks for better agility and weight capacity. Finish by researching the top engine, then the radio. Success with the Object 416 encouraged factory #75's design bureau to continue working on similar layouts, this time with the Object 430. The draft was ready in 1953 in two variants. The first was classical: engine and transmission in the rear, turret in the front, driver in the front of the hull. The second was similar to the Object 416: the crew was in the turret, which was in the rear, the engine was in the front. The more conservative version of the tank was approved. 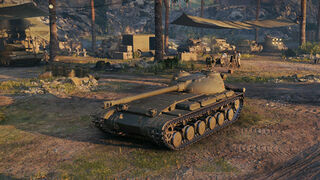 As for variant #2, it inspired the Object 430 II in World of Tanks. This page was last modified on 27 June 2018, at 19:57. This page has been accessed 45,480 times.